nobleNote is an application to make a note on your desktop. Lubuntu ships with version 1.0.8 of nobleNote. 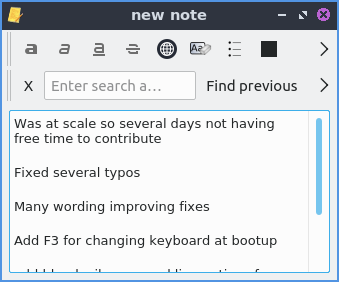 To start a new note right click on the right hand column new note or Edit ‣ New note. Then enter a title for this note. To open a note double click on that note from the right hand column which will open a new window with your note in it. To input text in the note type in the main body of this window after clicking on it. If you wish to delete a notebook right click on a notebook and delete notebook, or with the notebook highlighted press Control + D, or Edit ‣ Delete notebook. To delete a note click on the note and press the button with a page X on it, press Control + Shift + D or edit Edit ‣ Delete note. To import notes from a file File ‣ Import. If you make a mistake typing and want to undo your changes press Control + z or Edit ‣ Undo. If you wish to paste text into nobleNote press Control + v or Edit ‣ Paste. To copy text from your note press Control+C or right click and select Copy. To select all text in a note press Control +A. To change preferences of nobleNote press Control +P or Settings ‣ Configure. To keep nobleNote in your system tray after you close nobleNote check/uncheck the Close to tray checkbox. 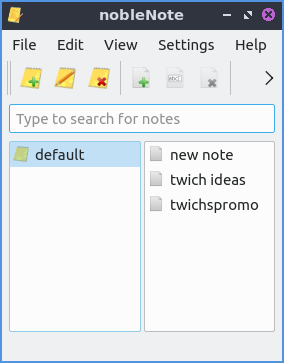 If you want to change the font for editing notes change the Note Editor default font underneath has the font and font size. If you want to toggle showing notes in HTML format check/uncheck the Convert notes to the HTML format. If you want to toggle the menu entry to show source check/uncheck the Show “Show source” menu entry. To reverse the direction of scrolling in nobleNote check the touch screen scrolling checkbox. To toggle showing the toolbar press Control +Shift +T or View ‣ Show toolbar. To bring back up your note nobleNote will leave a notebook icon in the system tray on the lower right hand corner of the panel. To bring the notes backup after closing them left click on the tray icon. To fully close nobleNote right click on the tray icon Quit.